This chart shows estimated plug-in electric vehicle and total light vehicles sales in the U.S. in 2018. Fueled largely by the release of Tesla's "mass market" Model 3, electric vehicle sales in the United States jumped 81 percent in 2018 compared to the previous year. According to InsideEVs, an online platform tracking the progress of electric mobility, plug-in electric vehicle sales amounted to 361,307 in the U.S. last year, up from 199,826 in 2017. While that is by far the biggest jump in EV sales ever recorded in this still nascent market, it still isn't enough to put electric cars anywhere near mass adoption. 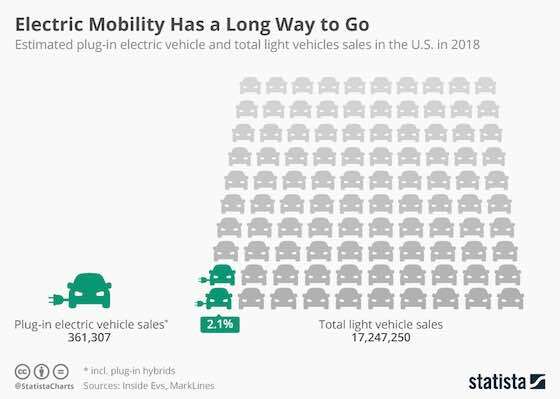 In fact, for every electric car sold in 2018, 50 conventionally powered cars hit America's roads, meaning that electric vehicles accounted for just 2.1 percent of the 17.2 million light vehicles sold in the U.S. over the past twelve months. Considering that President Trump recently celebrated the currently low gas prices as "another tax cut" and took credit for supposedly telling people at OPEC to "let that damn oil and gasoline flow", the outlook for electric mobility isn't as positive as last year's growth rate would suggest though. It remains to be seen if the momentum can be kept going without the impetus of a new Tesla model launching. When Tesla broke ground on its first factory in China recently, some people were questioning the timing of the company's expansion to the country. Amid trade tensions, a general economic slowdown and cooling consumer confidence, the Chinese automobile market contracted by 2.8 percent in 2018, marking the first annual decline in more than two decades. As China's Association of Automobile Manufacturers (CAAM) reported, the production and sale of automobiles amounted to 27.8 and 28.1 million units, respectively, last year, following six consecutive months of declining sales. But then again, it's a very specific segment of the market that Tesla is after, and looking at electric vehicle sales paints and entirely different picture. According to CAAM, sales of new energy vehicles, as plug-in electric vehicles and plug-in hybrids are referred to in China, grew by more than 60 percent last year, reaching 1.26 million units. According to Tesla CEO Elon Musk, the Shanghai-based Gigafactory will produce lower-cost versions of the Model 3/Y specifically targeted at the Chinese market. “Affordable cars must be made on same continent as customers”, Musk wrote on Twitter, not to mention that a production plant in China could shield his company's Chinese ambitions against tariffs and other import duties. 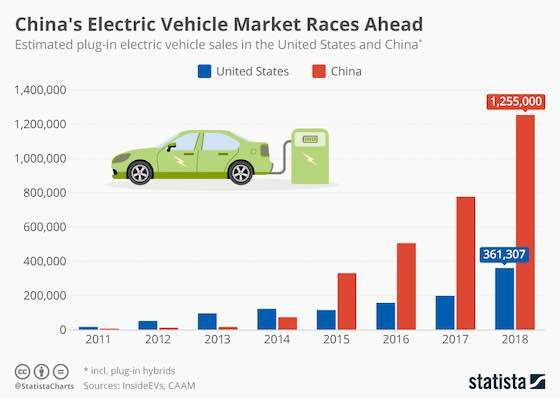 As the following chart shows, the Chinese market for electric cars is more than three times the size of its U.S. counterpart, illustrating why it makes sense for Tesla to double down on its ambitions in what is still the world's largest automobile market. 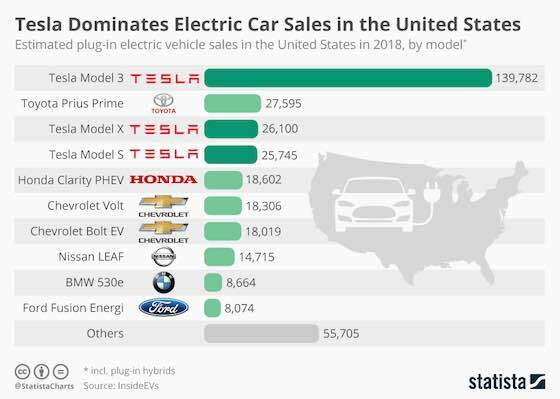 Having more than doubled its vehicle production in 2018, Tesla single-handedly propelled electric vehicle sales in the United States to new heights. According to industry blog InsideEVs, the company accounted for more than 50 percent of electric car sales in the U.S. over the past 12 months, as the Model 3 grew into its envisaged role as the first mass-market Tesla. Tesla reportedly sold almost 140,000 units of the Model 3, outselling the second most popular electric car, the hybrid Toyota Prius Prime, 5 to 1. Tesla's Model X and Model S were the third and fourth most popular electric models, capping what was a turbulent but successful year for the company led by its eccentric and at times controversial founder Elon Musk. "Electric Mobility Has a Long Way to Go"